Luck was not on the side of the All-Stars this St. Patrick’s Day as they took on the Tallahassee Capital Punishment in the second of the double header event. The game was characterized by high penalties with only a handful of jams starting with a full contingency of blockers on the track. It also started off with, and maintained, a quick place with one or the other, and sometimes both, teams taking a knee in front of the jammer line to force a no pack start. Both teams focused their energies on defense leaving their jammers to fight through walls of opponents with little help from their blockers. 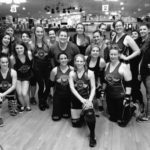 The Charlotte Roller Girls All-Stars walked away from this home season opener with a loss earning 89 points to Tallahassee’s 223. The All-Stars wasted no time, starting the bout off immediately by taking a knee at the jammer line. 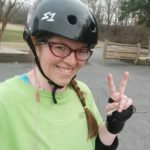 Charlotte skater Shawn Shank Redemption battled a wall of Tallahassee orange, while Capital Punishment jammer Stone Her fought with a barrier of Charlotte blockers. Stone Her won her battle first and emerged as lead jammer, but Shawn was not too far behind. Stone Her earned 3 points and Charlotte put 2 on the board. 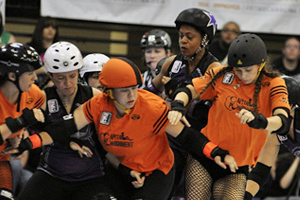 In the next jam, Charlotte sent Do U Juana to the line against Capital Punishment’s Great Wall of Gina, who earned lead by skating to the outside of the pack. She picked up a full 4 points before calling off the jam. 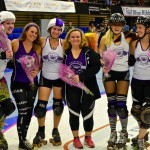 In the next lineup, Tallahassee took a knee at the jammer line as their jammer, Low Maim, gained lead jammer status against Charlotte skater Lykr C’leen. The Capital Punishment began to pull ahead of Charlotte with Low Maim picking up 9 points, while Lykr C’leen tried to contend with a solid wall of orange opponents. 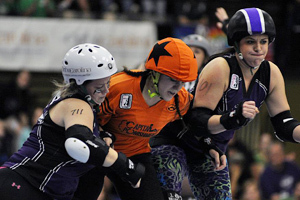 Tallahassee continued their lead jammer streak as Stone Her broke through the pack almost instantaneously ahead of All-Stars jammer Rosie Cheeks after a no pack start. Penalty troubles also started with this jam with Charlotte down 2 skaters and Tallahassee down one. Stone Her added another 9 points to the board before the jam was called. Shawn Shank Redemption earned the first lead jammer status for Charlotte in the next jam against Great Wall of Gina, utilizing the one blocker advantage to skate through on the inside line and add 4 quick points to Charlotte’s score to bring their total to 6 to Tallahassee’s 25. Do U Juana, taking advantage of Tallahassee’s continuing penalty trouble, was able to chip away a little more at the point difference picking up 3 points after earning lead jammer over Low Maim. Unfortunately, she called it off a little too late allowing Low Maim to earn one point of her own. The next jam started with two Capital Punishment blockers in the box, both with less than ten seconds on their penalty. However, that was enough time for Charlotte to capitalize on the situation with jammer Lykr C’leen cutting through the pack on the inside. She earned 3 points for Charlotte, but got caught up with Tallahassee’s blockers and called off the jam too late, allowing Stone Her to earn a full 4 points. 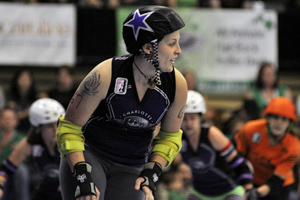 Shawn Shank Redemption continued the lead jammer streak as she went toe to toe with Great Wall of Gina once again. Great Wall of Gina took a bit of a different tactic in this jam and stayed in the pack for a while playing defense as a blocker. Again, Charlotte’s jammer was too late in calling off the jam allowing Tallahassee to earn 3 points to their 2. At ten minutes into the game Lykr C’leen donned the star against Stone Her. Both skaters received minor penalties on their way through the pack. In the full two minutes of the jam Lykr C’leen added 11 points to Charlotte’s total, bringing them to 27. Stone Her scored 20 of her own taking Tallahassee’s score to 53. The next jam started off with a full contingency of All-Star and Capital Punishment blockers, a rarity in this penalty-heavy game. Shawn Shank Redemption earned lead jammer for the All-Stars and added a full 15 points to Charlotte’s score, closing the point gap to just 11 points after Tallahassee’s jammer Great Wall of Gina was sent to the penalty box for a back block. After a brief official timeout, Charlotte’s Do U Juana took the line against Low Maim. This was the first jam of the bout to not begin with a scrum start at the jammer line. Low Maim broke through the pack first, but Do U Juana was right on her heels, causing Low Maim to call the jam before either skater earned any points. The next jam started with just 2 blockers from each team on the track. Tallahassee took a knee to start the jam immediately, with the advantage going to their jammer Great Wall of Gina. She earned a full 4 points for Tallahassee, while Lykr C’leen added 2 of her own to Charlotte’s total. 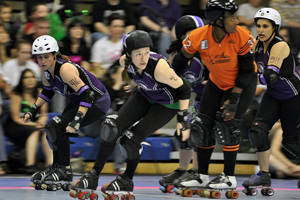 Do U Juana took lead jammer status in the next jam, but instead of points, she earned herself a trip to the box for a major back block leaving Low Maim on a power jam with a full Charlotte penalty box as Drew FearMEMore and Rosie Cheeks sat out their penalty minute. Charlotte’s penalty box remained full as Ms. Guided Angel was sent to the box shortly after Drew FearMEMore was released. The light pack allowed Great Wall of Gina to add 19 points the board. The point spread started to increase as Shawn Shank Redemption was the only Charlotte jammer able to add a single point to their score in the next 7 jams, while Capital Punishment increased their lead by 19 more points to take the totals to 47 to 97. With just over 4 minutes left in the half, Shawn Shank Redemption was the next skater to make any traction on the board for Charlotte adding one more point, despite not earning lead jammer status against Great Wall of Gina. With a little over 2 minutes left in the period, Do U Juana broke through the pack on the inside line ahead of Low Maim, but got stuck behind a wall of orange Tallahassee blockers and was too late in calling off the jam, permitting Low Maim to earn 2 points. 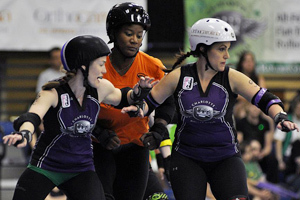 With 45 seconds left on the clock, Lykr C’leen faced off against Stone Her, who grabbed lead jammer status and scored 4 points. However, she wasn’t able to call of the jam before Charlotte gained 4 of their own taking the score to 52-103 in favor of Tallahassee Capital Punishment at the half. The Charlotte Roller Girls were off to a rough start in the second half, going 6 jams before adding any points to the board, while Capital Punishment increased their lead by 18. Maybe it was Rosie Cheeks’ intimidation tactics as she started blocking facing backward in the pack, or Charlotte’s one blocker advantage, but Do U Juana was finally able to break the streak by adding 3 points to the board when she took on Tallahassee jammer Catchup. Shawn Shank Redemption broke through the pack for lead in the next jam and earned two points before Low Maim caught her and turned on the defense for some jammer on jammer blocking. 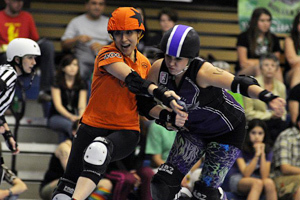 After another official timeout to review penalties leaving Charlotte down two skaters, Charlotte’s Bashionista took the track to face off with Great Wall of Gina, who earned lead jammer status. She wasn’t able to pick up any points though as the jam was called for an injury on the track as Bashionista took a tumble after tangling up with some Tallahassee blockers. Tallahassee skater Catchup advanced her team’s score another 3 points in the next jam against Do U Juana with a light pack, as two skaters from each team sat in the box. Shawn Shank Redemption picked up lead jammer in her next turn on the track breaking straight through the middle of the Tallahassee defensive wall and added 4 points to the board, but allowed Low Maim to add one of her own. Do U Juana struggled in the next jam with a wall of Capital Punishment blockers in the back of the pack. Tallahassee’s jammer Great Wall of Gina even joined in on the action playing defense in the pack for a while, and still earned 18 more points for her team. The pack continued to remain light in the next jam with both teams skating down two blockers as Lykr C’leen hit the track with Catchup, who broke through the pack first but was unable to earn any points as Charlotte’s jammer emerged right on her heels. Penalties escalated in the next jam leaving a single Tallahassee blocker with 2 Charlotte blockers on the track at the start of the jam. Two of Tallahassee’s blockers quickly rejoined the action and helped get Low Maim through the pack to earn lead jammer ahead of Shawn Shank Redemption. Low Maim scored 3 points, but allowed Shawn to earn 2 for the home team. After another official timeout to discuss penalties in the previous jam, Do U Juana took the track against Great Wall of Gina and also took the lead. She added 4 points to the All-Stars’ total, but called the jam too late allowing Tallahassee to earn 4 as well. With less the 15 minutes left in the game Shawn Shank Redemption put on the star to line up against Catchup and took lead jammer despite a Charlotte blocker deficit. She earned 3 points, but not before Catchup earned 3 as well. Low Maim increased Tallahassee’s lead by 4 more points when she hit the jammer line with Rosie Cheeks. Do U Juana added 2 more points to Charlotte’s total in the next jam. Shawn Shank Redemption made a valiant effort for the All Stars earning lead jammer status and 10 points as the Charlotte blockers kept Great Wall of Gina contained. Do U Juana had some more success adding 6 more points to Charlotte’s score while Low Maim only gained 5. With 9 minutes left in the game Catchup only had time to add a single point to the board before the jam was called for an injury on the track with Charlotte jammer Lykr C’leen. Stone Her returned to the track in the next jam against Shawn Shank Redemption to gain 3 more points, increasing the Capital Punishment’s total to 164 to the home team’s 89. In the last 7 minutes of the game, Charlotte wasn’t able to make any more advancement in their score, facing penalty troubles with their jammer Bo Toxic Bruz’her and losing lead jammer status to Tallahassee in each jam. The Capital Punishment pulled even further ahead of the All Stars in those final minutes increasing their lead by another 59 points. The game ended with a win for the visiting team with a final score of 89 to 223.